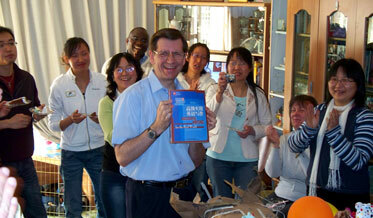 Kunming Medical University Foreign Expert Michael Krigline's new English Writing book was released on April 2, and 20 university leaders, foreign experts and students joined him to celebrate. The textbook is the result of a six-year process involving input from around the globe. The advanced English writing textbook, Successful Writing for the Real World (高级实用英语写作), is available from China's leading English textbook publisher: Foreign Language Teaching and Research Press (外语教学与研究出版社). Focused on producing authentic English for the "real world" outside campus walls, the book's three sections (Writing Skills, Types of Writing, and the Better Writing Study Guide) teach learners to communicate through clear and simple English. 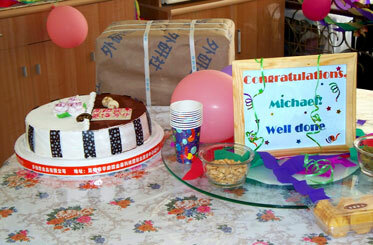 Mr. Krigline hosted the party at nearby Chuangyi Yingguo. Honored guests included Dr. Liu Hong, head of the KMU Foreign Affairs Office, and Vice-Dean Shang Li from the university Graduate Department, along with several foreign experts who work in Kunming and representatives from the Hong-Kong based Jian Hua Foundation. Some of Mr. Krigline's students also participated, and particularly enjoyed the chocolate cake from Dobos and cheesecake from Jiahua bakery. Technically, the project started in 2002 when Mr. Krigline was helping Prof. Zheng Shu Tang (郑树棠 - 上海交通大学) proofread New Horizon College English Book 2 (新视野大学英语). Prof. Zheng, highly respected among China's English teachers, wrote the preface for Successful Writing, as well as the introduction on the back cover. After moving from Shanghai to Xi'an in 2002, Mr. Krigline developed advanced writing materials while teaching at NPU (西北工业大学). First, he adapted the basic writing skills advice in Secrets of Successful Writing into a textbook. The late DeWitt Scott poured 40 years of experience as a writer, editor and instructor into Secrets, showing writers that "simple, conversational language results in clear writing." From there, the book grew as chapters were created to take students past "classroom" writing to practical English writing that they can use after graduation. Since 2003, Chinese English-learners, Chinese teachers, and foreign teachers here and abroad have tested and proofread the book, adding suggestions which have resulted in a thick (477 pages), practical resource and study-guide for advanced learners. You can order the book from your favorite bookstore using this reference information: ISBN 978-7-5600-7264-7; 外语教学与研究出版社; Chinese title: 高级实用英语写作. List price: 43.90 RMB. Unlike most Chinese writing textbooks, this book does not present a pure step-by-step introduction to writing. Instead, it was designed to give students an interesting variety of lessons while building important skills and expanding their understanding of English writing. Real World is actually three books in one, interwoven to fill an academic year for third-year English majors (or those at a similar English level). Writing Skills lessons cover the writing process, from pre-writing organization to final editing. Types of Writing lessons introduce eight practical styles, including academic essays, journalistic writing, product reviews and basic business correspondence. The Better Writing Study Guide (four lessons) shows how to overcome common problems experienced by Chinese English-learners. Seven boxes like the one in this photo arrived from the publisher on March 31, 2008. Opening the boxes gave the Kriglines a good excuse to order a cake and and celebrate with colleagues, students and friends. 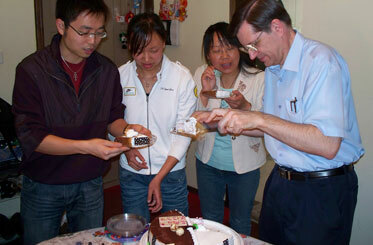 Students helped distribute the cake, and enjoyed eating it too! Mr. Krigline pulls the first book from it's wrapping, to the applause of guests. Kunming Medical University officials were among the honored guests who gathered to celebrate this achievement. 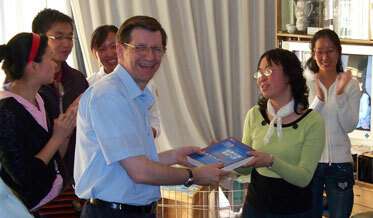 Mr. Krigline presents a copy to one of his bosses, Vice-Dean Shang from the university Graduate Department. 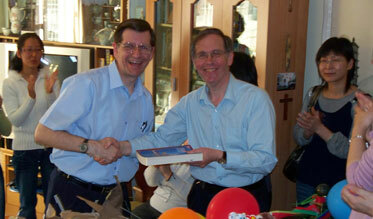 Michael also presented a copy to Dr. John Davy (Kunming University). John was one of many Foreign Experts who helped proofread sections of the book, while offering suggestions on how to improve it. Additional copies will go to contributors in Kunming, Xi'an, Shanghai, Beijing, Canada and America. Kunming Medical University Foreign Expert Michael Krigline's new Writing textbook was released on April 2, and 20 university leaders, foreign experts and students joined him to celebrate. The textbook is the result of a six-year process involving input from around the globe. Successful Writing for the Real World is an advanced English writing text that focuses on producing authentic English for the "real world" outside campus walls. It's three sections teach basic writing skills, eight practical types of writing, and how to overcome common writing errors. 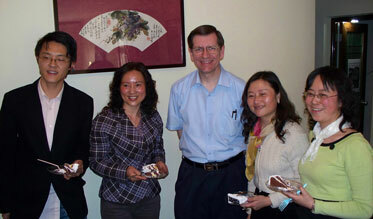 Guests at Mr. Krigline's party included Dr. Liu Hong (KMU Foreign Affairs Office) and Vice-Dean Shang Li (KMU Graduate Department), along with several foreign experts who work in Kunming and some of Mr. Krigline's students. The project started in 2002 when Mr. Krigline was helping Prof. Zheng Shu Tang (郑树棠 - 上海交通大学) proofread新视野大学英语. He developed materials while teaching at NPU in Xi'an (西北工业大学), and since 2003, suggestions from Chinese and foreign English-learners and teachers have resulted in a thick (477 pages), practical resource for advanced learners. Use this information to order the book locally: ISBN 978-7-5600-7264-7; 外语教学与研究出版社; 高级实用英语写作; 43.90 RMB. © 2008 Michael Krigline, all rights reserved. People are allowed to print/copy/use material from this web page to let others know about this book. I'm not sure the "counters" on my pages are still working right, but I'll leave them anyway.